Before you can receive your first shipment of CAYSTON, it is important that you complete and understand the following steps in preparation. 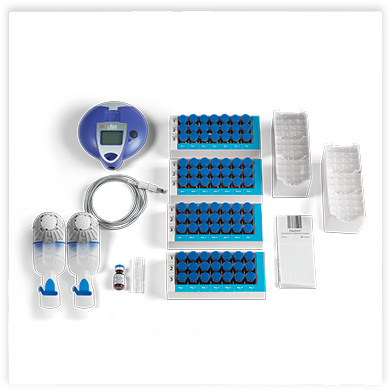 Your cystic fibrosis care team will ask you to complete a Cayston Access Program application form [English] [Español], which is required to provide you with the Altera® Nebulizer System, along with additional methods of access and support. Most insurance plans will automatically select a specialty pharmacy for you. If you are able to choose one, make sure the specialty pharmacy you choose is covered by your insurer. Learn more about specialty pharmacies here. Call your specialty pharmacy to order and confirm a delivery date for your first shipment of CAYSTON. If you do not take this step, your CAYSTON will not be delivered to your home. Remember: your specialty pharmacy may call you from an unknown number to set up an account—be sure to check your voicemail for messages from missed calls. For a list of specialty pharmacies and their contact information, click here. Before you receive your first treatment, it’s important that you familiarize yourself with your Altera Nebulizer, what you need to do before taking a dose of CAYSTON, and how to prepare your CAYSTON for treatment. For more detailed instructions on prepping, click here. It’s critical to your treatment plan that you fit all three doses of CAYSTON into your schedule. Learn more about how CAYSTON can fit into your day here. To reduce the risk of infection and ensure proper operation, the Altera Nebulizer Handset should be cleaned after each treatment and disinfected at the end of the day. You should clean and dry your Altera Nebulizer Handset(s) as soon as possible after each use. Click here for more detailed instructions on how to disinfect and clean your Altera Nebulizer Handset. Sticking to a treatment plan can be tough. No matter where you are on your CAYSTON journey, My Cayston Partner offers tips and tools that may help you stay on track with your treatment plan. Enroll today to explore all that My Cayston Partner has to offer.